TomTom app for iPhone launches on iTunes Store today | What Hi-Fi? TomTom for iPhone is available in five guises, covering UK & Ireland, Western Europe, US & Canada, Australia and New Zealand. The UK & Ireland app costs £60. 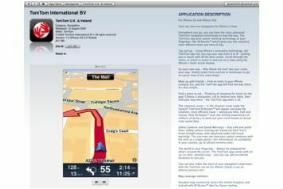 Requiring iPhone OS 3.0 or later, the app includes touchscreen controls, TomTom IQ Routes, multiple display options and updatable maps. Automatically syncing with your address book, it should be easy enough to navigate to your Mum's in a couple of clicks. While the likes of CoPilot, MotionX and TrafficUK have proved popular in the world of iPhone navigation tools, TomTom's success in the in-car sat-nav world means the company's arrival is sure to prove a hit.